UPDATE: Exciting news! We are proud to announce that Mantissa Ltd. is bringing Cryptozookeeper to the Google Play Store! 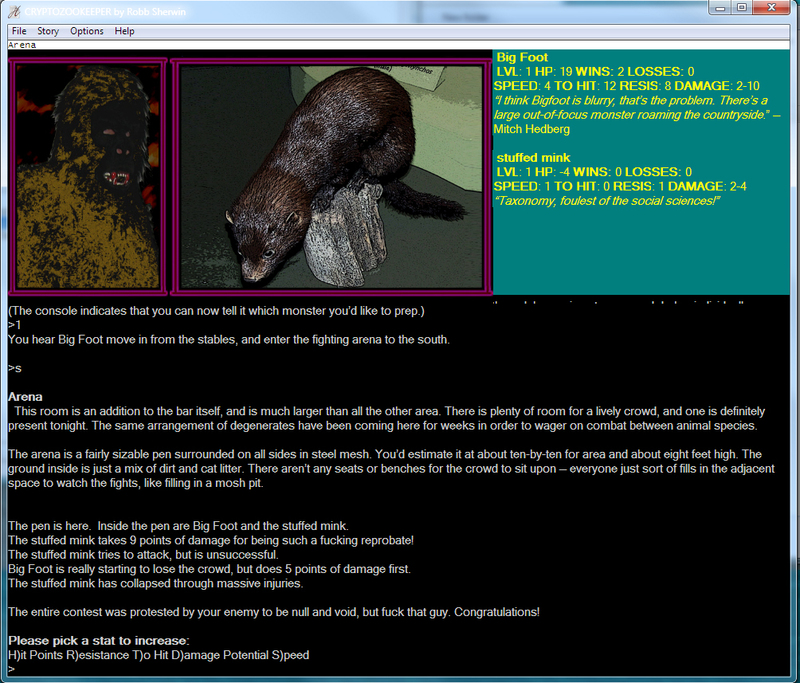 You have found a cryptozoology game! 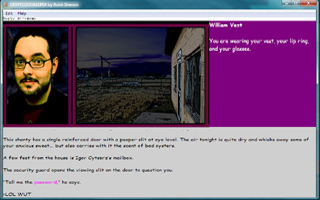 Cryptozookeeper is a character-driven graphical text adventure. Features include over 60 cryptids to create and train, over 200 characters to find total, over 12 hours of gameplay and a soundtrack of over 60 songs. I created Cryptozookeeper between 2006 and 2011. I wanted to make a full-length graphical adventure game that had funny characters in off-beat situations, all within an alternate future. The central premise of the game is that you play a guy named Vest that discovers machinery that allows him to build cryptids from the DNA of normal animals. 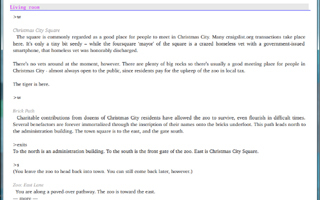 Sprinkle in some unwilling accomplices, a grim and gritty city to explore and some fun dialogue and you’ve got an idea what’s in store for you. 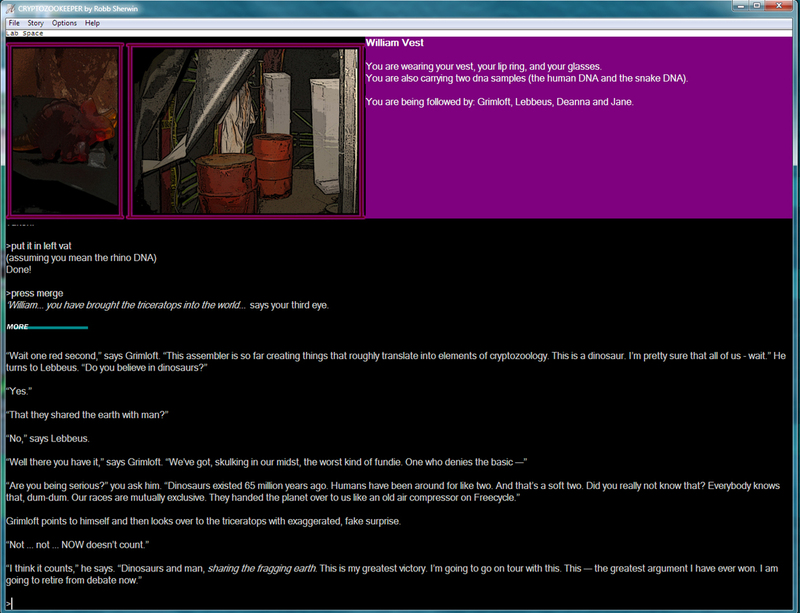 Cryptozookeeper also attempts an “episodic” take on adventure games. I wanted to make the game seem like the best season of television you’ve ever played. 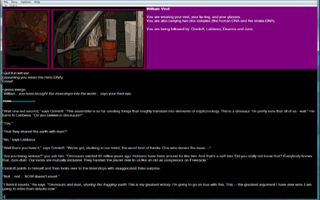 There are a couple reviews of the game posted to the Interactive Fiction Database at tads.org. * 2-Disc set in a dual amray package. * Disc One is a DVD featuring the game and extras. 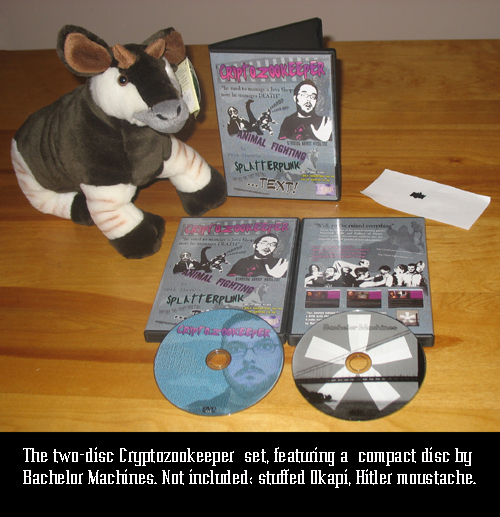 * Disc Two is a music compact disc featuring new and in-game music by Bachelor Machines. * From Robb Sherwin, creator of the XYZZY-winning games Fallacy of Dawn and Necrotic Drift. * DVD also includes the game’s source code, a file with all the game’s art assets and interpreters for Windows, Linux and OS-X. * DVD also includes the actual game, natch. Looking for reviews? See further down the page. Track Listing for the music disc by Bachelor Machines. The complete list of winners is here at xyzzyawards.org. TECHNICAL HELP: Sometimes the graphics can look incorrect when playing, especially if you’ve used Hugo to play other games before. 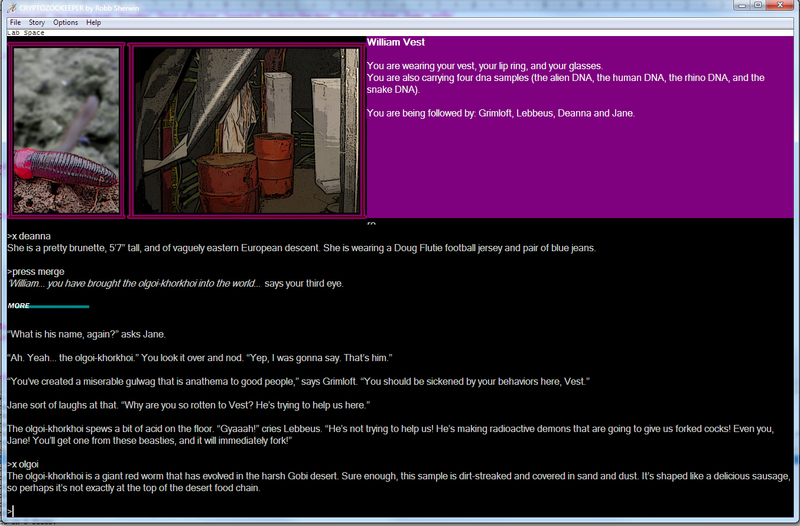 To make the graphics look right in Cryptozookeeper, pick a Fixed Width font size of 8. To do that, do the following in your interpreter: Options (or Edit)->Fonts->Fixed Width-> and then any font, with a size of 8. The spacing on the top windows will then be good. 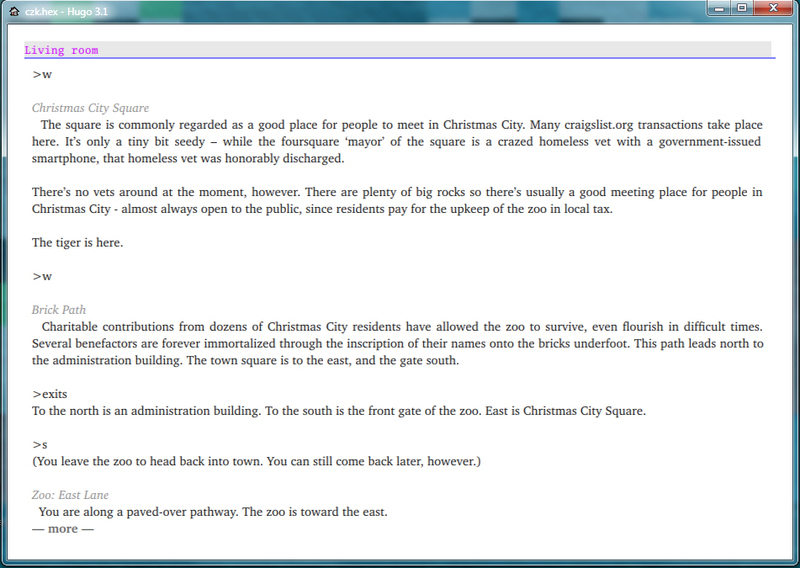 If you have other questions getting the game to run, please write me at beaver@zombieworld.com. If you want to play on Linux, download the same zip file and then download the Hugor interpreter. Check Hugor’s readme to ensure you have all required libraries. If you want to play on Macintosh OS-X, download the zip file and the the Hugor interpreter for Intel Macs (10.5+) or Power PC (10.5+). Screenshots I’ve done two interviews about the game, at FWONK and Gnome’s Lair. Cryptozookeeper made an appearance at the 2011 Oklahoma Video Game Expo in Tulsa. Oklahoma is a fine state for cryptozoology. I got a table with fellow text game author Rob O’Hara and we had many text adventures on display for the show. More info here. 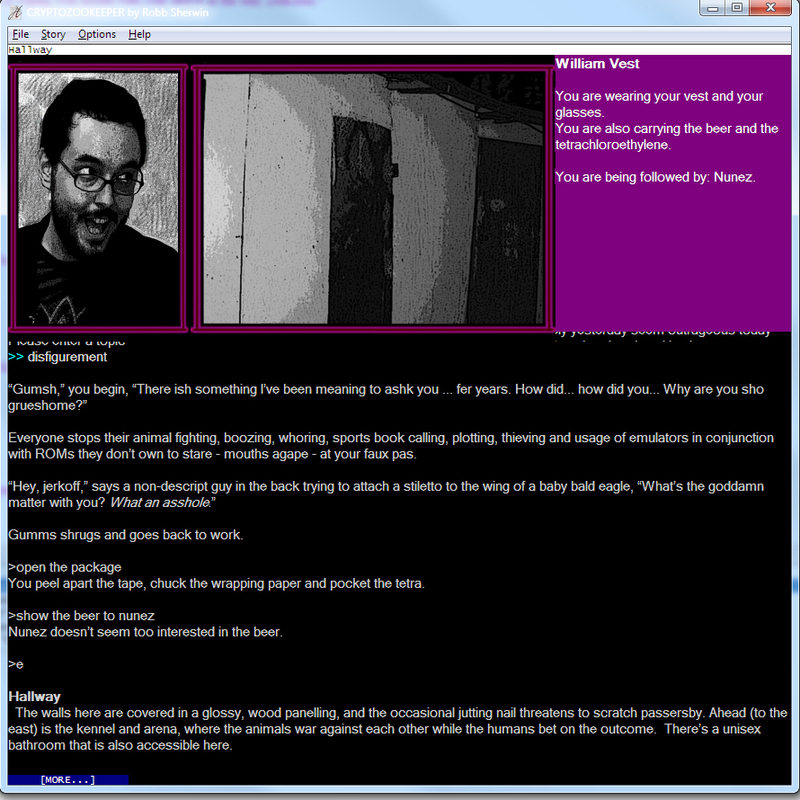 I did an interview with Jason Dyer back in 2008, when I was still working on the game, which you can read here. Cryptozookeeper is for sale on Steam for Windows but can also be played on OSX and Linux. It has been released via Creative Commons. It is not possible to “pirate” Cryptozookeeper. For OSX and Linux play, click on the icon above to get the Windows version no matter what system you have or buy the game through Steam. The OSX and Linux icons lead to interpreters. Just start the interpreters and load czk.hex from the Windows download to play on OSX and Linux. 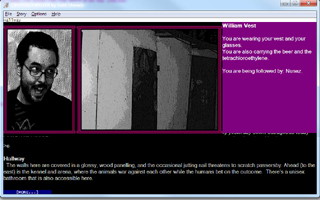 The Twitter feed for Cryptozookeeper! Testing by Marshall Abbott, Bananadine, James Bernoski, Jonathan Blask, Greg D’Avis, Ben Davis, Michael Fransioli, Alex Gray, Juhana Leinonen, Rob O’Hara, George Oliver, Drew Mochak, Marius Mueller, Ben Parrish, Brian Rapp, Johnny Rivera, Paul Robinson, Sorrel and Mike Sousa. Acting by Gerrit Hamilton, Jonathan Blask, Alex Gray, Dayna Rich, Dustin Godec, Alana Short, Randy McLellan, Adam Thornton, Golem, Robbie McLellan, Jennifer Nicol, James Bernoski, Steve Davis, Ben Parrish, Matt Randall, Michael Sherwin, Marshall Abbott, and Stephen Granade. Music by Bachelor Machines, Aliaspharow, Arthur Loves Plastic, Beatloaf, Ben Parrish, Brokenkites, Butterworth, Conor McCauley, Darkangel, Dejersey, Ezek1el, Fireproof Babies, FM-RA, Four Tet, I Have A Box, I2B5K0, Inkraktare, J. Lang, Joao Picoito, Jonathan Coulton, Kabukiman, Kaer Trouz, Liquid Stranger, Mana Junkie, Mika featuring Colab, Minimal States, Nebula Nerd, Perrgynt Lobogris, Per, Planet Boelex, Psychadelik Pedestrian, Robin Smith, Rudeboys, sdery31, Sinerider, Smoke & Mirrors, Soundprank, The Ambient Society, The Echoed, The Long Mouth Castle, X|K, Xtrngr and Ytrebygdaflyveklubb. Original Art by Steve Davis, Jeffrey Olson, Robb Sherwin and J. Robinson Wheeler. Photography by Greg D’Avis, Amanda Gardner, Gerrit Hamilton, Kathy Harter, Randy McLellan, Rob O’Hara, Ben Parrish, Quentinbec, Dayna Rich, Anneli Salo, Jason Scott and Robb Sherwin. Greetz to the music label FWONK and the Internet Archive. Cryptozookeeper is released via the Creative Commons 3.0 Attribution-Noncommercial-No Derivative Works 3.0 Unported license. 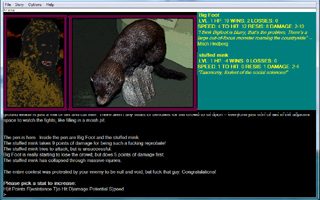 Special thanks to Big Foot, the Loch Ness Monster, the fur-bearing trout, the talking dog and the Mongolian Death Worm. 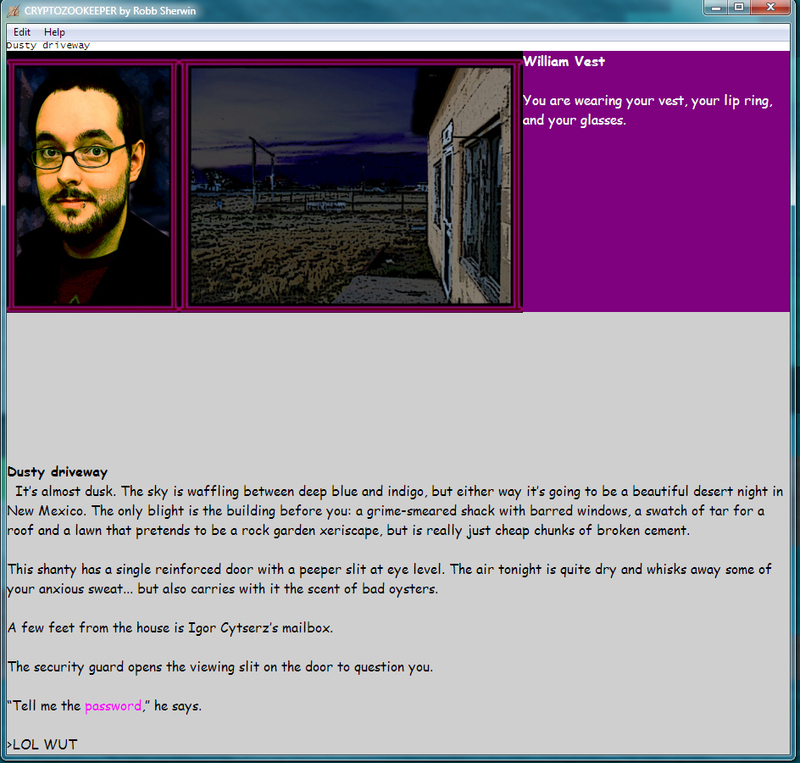 http://www.joltcountry.com/index.php/robbsherwin_videogame/cryptozookeeperYou must be logged in to post a comment.